Spokane restaurant development-related news. Focused primarily on new restaurants and eateries. This weekend is jam-packed. There’s a lot going on in the area, and we wanted to fill you in so that you can take full advantage of all of the opportunities presented to us here in the inland Northwest. Here’s a roundup of the most popular events going on around the area this weekend. Volume Music Festival. The Inlander’s music festival grows again this year, with eight venues and 80 bands. More shows than ever will be all-ages, and with acts like Summer in Siberia, Terrible Buttons, and Water Monster, it’s sure to be an exciting event. Wristbands are just $17, and they get you into every show tonight and tomorrow. Even cooler, for the first time ever, there’ll be a discussion panel on the State of the Spokane Music Scene. For more information, and to plan your schedule, check out volume.inlander.com. ArtFest. Sponsored by the Inland Northwest Museum of Arts & Culture, ArtFest is Spokane’s major juried art festival. Brilliant paintings, stunning sculptures, and excellent photography will all be showcased, among other work. The event runs from 12p-10p today, 10a-10p tomorrow, and 10a-5p Sunday in Browne’s Addition. It’s free (including parking at the MAC garage, if that’s an issue for you, although we encourage you to utilize transit if possible), and there will be great music. For more information, click here. SkyFest. After several years, SkyFest returns to Fairchild Air Force Base after a budget cut- and sequester-induced hiatus. The air show and vendor fair will be open Saturday and Sunday from 9a-6p, and will include all of the usual events. More information available here. Spo-Can. The Elk’s second-annual craft canned beer festival will take place Saturday and Sunday in Browne’s Addition. Over 50 canned beers will be showcased, and four bands will be performing. More information by clicking here. In addition to the above, Spokane Comicon is this weekend, in addition to a nature festival at Turnbull National Wildlife Refuge, farmers’ markets, and live music at the Rocket Market. Be sure to get out in the community check these events, and share your Spokane adventures using the hashtag #SpokaneStoke and #spokanerising. We love to connect with you. 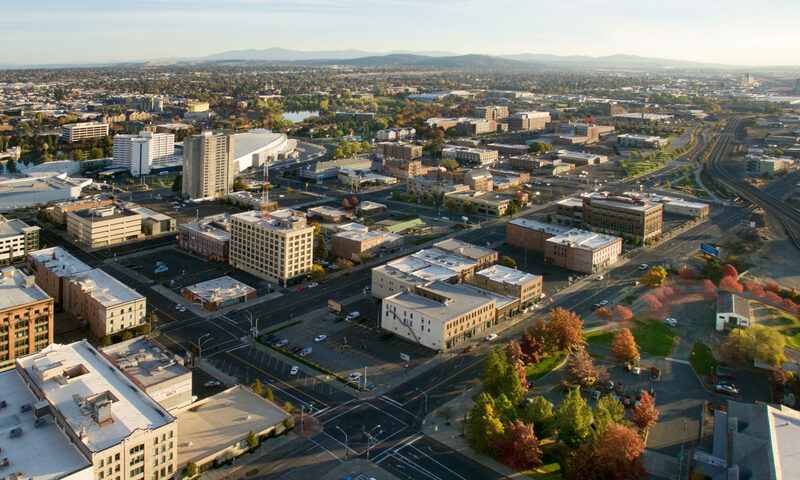 We realize that The #spokanerising Project focuses primarily on livability, urban development, and quality of life, but sometimes quality of life means something more than walkable neighborhoods and achieving urban density. It’s about the prevailing lifestyle of an area, how people choose to spend their time, where their passions lie. It’s about food, culture, entertainment, activities, and vibrancy. And so we pose the question. Has anyone else noticed that Spokane’s brewery scene has exploded recently? Two breweries (Ponderosa Brewery and Young Buck Brewing) will be sharing the space previously occupied by Spokane Public Market, and another (Empire Brewing Company) will be opening at some as-yet-unnamed location. This in addition to the breweries either opened or substantially retooled in the past few years (NoLi, Iron Goat, Ramblin’ Road, Orlison, Budge Brothers, River City, Perry Street, etc.). Other would-be brewers have started crowdfunding campaigns in order to raise funds, some with more success than others. These breweries contribute to a sense of urban vitality and help develop Spokane’s unique culture. In cities like Portland and Seattle, local brewpubs and craft breweries play an important role in building a cohesive city identity. The same could be true for SpokaneWith all of our recent brewery openings and more on the way, it’s clear that beer makes Spokane a better place to live. Craft Beer Week runs until Saturday, May 18. Local breweries are running specials, tastings, classes, and other cool and special events all week, so be sure to get out and get a sense of our local scene. What do you think? Can beer play an important role in establishing a city identity from which to draw pride? Do craft breweries make Spokane a better place to live? Share your thoughts on Facebook, on Twitter, on this blog, or in person. We love to hear from you. Could “the market” by Safeway be one solution to our downtown grocery problem? “the market” by Safeway occupies this urban corner in downtown San Jose. It’s a fully-stocked store. Perhaps it could be a solution for downtown Spokane? Supermarkets are important. Though in recent years, people have been moving away from traditional grocery stores and toward specialty retailers like Trader Joe’s and discount clubs like Costco, the problem of food remains a critical issue. In a vibrant urban downtown, it’s essential that a grocery store serve the population by providing nutritious, inexpensive products. It’s one of the necessities that will make-or-break a downtown from a livability and residential perspective. No grocery store? Good luck convincing families and young people to locate there. Currently, Spokane has no real downtown grocery store. Yes, Main Market operates on the east end of Main, but it’s focused primarily on organic and specialty items (it’s more of a Huckleberry’s than a Rosauer’s). And yes, Grocery Outlet remains open near Browne’s Addition, but that’s not within walking distance of most downtown residents. No, what Spokane needs is a mainline or more traditional grocer. Something like Safeway. It could be one good fit. The chain in 2008 opened a store in downtown San Jose called “the market,” which offered everything found in a typical suburban store, but in a smaller format better-suited to downtown streetfront locations. It’s done quite well, and helped to usher in a sort of renaissance of downtown housing in that city. Perhaps Spokane could move in that direction? Or maybe Rosauer’s, as a local company, could offer a home-grown solution? First, however, a developer needs to propose a building with enough first-floor retail space. That’s the most realistic scenario that would result in a downtown grocery store. What incentives are being offered for new construction downtown? Is there an incentive for opening a new grocery store there? What can be done to reduce red-tape for developers without compromising reasonable design standards? These are the questions that city leaders and citizens should be asking as we attempt to build a housing base downtown. What do you think? Does downtown Spokane need a more traditional grocery store? Share your thoughts below in our comments section, on Twitter, on Facebook, or in person. We love to hear from you. This mixed-use building at Kendall Yards will feature retail and restaurant space on the bottom floor and two stories of residential lofts on the upper floors. Photo taken March 23, 2014. Spring has sprung at Kendall Yards. The new urbanist/mixed use development near downtown has taken on a decidedly more urban (and local) feel of late, as Greenstone focuses on three new buildings in the neighborhood’s commercial district. With Yards Bruncheon now complete, construction is focused on Wandering Table next door, a building that will be the new permanent home for Veraci Pizza, and a new three-story mixed use building with streetfront retail and residential units above called the Highline Lofts. While some leases for the building are presumed to be signed, we only have confirmation that Brain Freeze Creamery will occupy the suite closest to Wandering Table on the western-most side of the building. With all of these local restaurants joining Central Food, it’s pretty clear that the neighborhood has become a venue of choice for homegrown local businesses much more in line with reality than the Marshall Chesrown/Black Rock designs we saw (and salivated over) in 2006. We’re excited to see which tenants are lined up for the almost-complete Highline Lofts building, when a proposed four-story mixed-use building between Veraci Pizza and Spa Paradiso will break ground, and what will become of the rest of the neighborhood, especially with plans for additional surface parking in lieu of underground garages in the commercial district. Just try to keep that aspect to a minimum, okay, Greenstone? For more construction and progress photos, hop along after the break. In today’s list of weird news, it looks like the Downtown Spokane Partnership is in very early discussions about the possibility of selling off and moving downtown’s Public Library in attempt to create more retail space. The news broke in the Inlander on Saturday, and the proposal is already drawing an extremely negative response on social media. Downtown Spokane Partnership President Mark Richard says that the downtown area has had to turn down major national retailers due to the dearth of available large-scale commercial/retail real estate. “They’ve had to turn down H&M and other larger prospects downtown because we don’t have the space to provide them,” Richard said to the Inlander. River Park Square is indeed thriving, but so is the library; according to the spokesman of the Spokane Public Library, Eva Silverstone, 22,000 people per month use the downtown branch, with usage up year-over-year. Contrary to popular reports, the library is not fading, growing ever more popular with each passing month. Still, downtown needs more retail space, and there are few good options. Mobius, the new(er) science center located across from Nordstrom, could move into a new space as it has been struggling in its current site. But that would only open up space for maybe one large-format retailer, like H&M. Riverside, Spokane’s historical “Main Street,” could be used to open up additional retail, with connections via Post, but unless a lot of retail opens both on Post and on Riverside at once, I can’t see people opting to walk two blocks out of the way just for one store. It may seem like overkill, but indications from mall leadership are to the contrary. “If I had another two blocks of street front we would [still] be full,” Bryn West, the general manager of River Park Square told the Inlander last fall. We’ll keep covering this story as it develops. We will focus on fresh food and local foods. We are not trying to be a fast-food restaurant. Jeff Nordvall, co-owner of Wisconsinburger, to be located at 916 S. Hatch on Spokane’s lower South Hill. The restaurant will feature an eclectic Midwestern menu, and it’s expected to open in March. For the full article, including a map of the location, click here to visit the Spokesman.